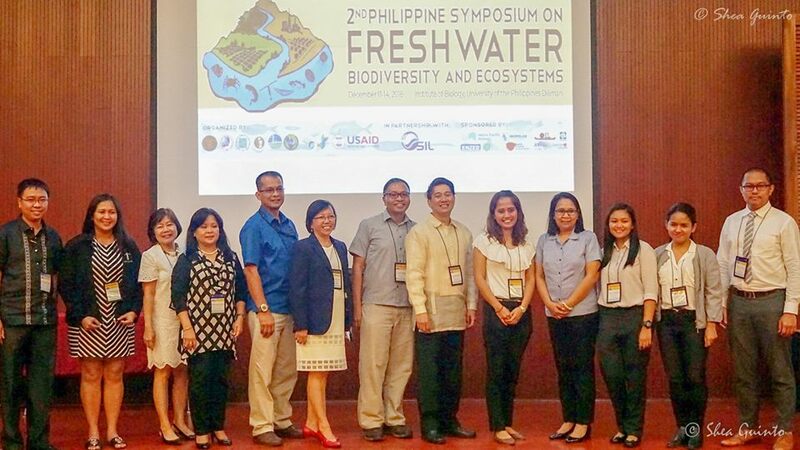 The Philippine Society for Freshwater Science is an organization conceptualized during the 1st Philippine Symposium on Freshwater Biodiversity and Ecosystems (PSFBE) held last June 7-10, 2016 at the University of Santo Tomas. The organization was then launched during the 2nd PSFBE held last December 11-14, 2018 at the Institute of Biology, University of the Philippines – Diliman. The water-drop-shaped logo symbolizes the importance of water itself to humanity and nature. This is outlined by the Philippine archipelago enclosed by an illustration of a flowing water (lotic) ecosystem. The two distinct dark blue-colored shapes that rest upon the base of the water drop represents groundwater and standing water (lentic) ecosystems, respectively. The light-colored line on top of these two illustrations represents available fresh water to be utilized in sustenance of life. Together, these signify the entire freshwater ecosystems in which the Filipino society must sustainably utilize and continually protect. Rey Donne S. Papa, Ph.D.
Ma. Vivian C. Camacho, Ph.D.
Jonathan Carlo A. Briones, Ph.D.
Ma. Lourdes C. Aralar, Ph.D.
Prof. Augustus C. Mamaril, M.Sc. Prof. Roberto C. Pagulayan, Ph.D.
Prof. Emeritus Macrina T. Zafaralla, Ph.D.
Acad. Prof. Rafael D. Guerrero III, Ph.D.
Prof. Ruben C. Umaly, Ph.D.